What is stump grinding and removal? Stump grinding Essex wide is the process of grinding out a tree stump to a depth of approx 6-12 inches under the ground’s surface using a specialist stump grinding machine. The machine can access entrances as narrow as 26 inches, making it very handy for tight access. We specialise in stump grinding Essex wide so if you are looking to get rid of an unsightly tree stump from your garden that is taking up precious space or posing a hazard, give us a call. There are various reasons people wish to remove tree stumps. You may want to or create a decking area or new unspoilt lawn, or perhaps you have building plans that are being put on hold by an annoying tree stump. Whatever the circumstances, give T.H Tree Services a call – even if you just need some friendly advice – our experts are here to help. Stump Grinding Essex: How Much Does it Cost? The cost of stump grinding Essex wide depends on a few things, namely the size and height of the stump, also the species of tree – whether it is hardwood or softwood. But you can rest assured that we offer some of the most competitive rates for stump grinding Essex homeowners will find. A stump grinder comes in many forms, from push-along to self-propelled. The best stump grinders are self-propelled and usually have a twin petrol engine from 5-50+ horsepower. At the business end of a stump grinder is the cutter wheel which consists of a large heavy metal disc. The disc has many teeth bolted to it made from a very durable tungsten carbide. Eventually the teeth wear out and need to be replaced. Rocks, metal, concrete and stones, etc. can destroy the teeth in seconds so it’s vital to clear the area before starting any stump grinding process. Removing a tree stump requires specialist equipment. 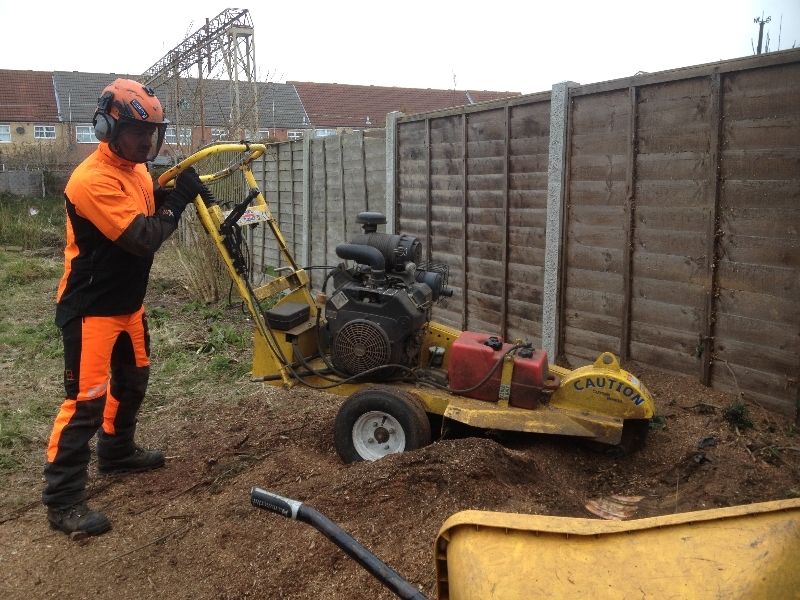 We have the knowhow and machinery to safely remove tree stumps using stump grinding. Essex based tree surgeons at T.H Tree Services are local authority and Trading Standards approved to carry out this work. Our machinery is suitable for tree stumps ranging from 2 inches to 4ft with a depth of up to 1ft. Afterwards, the stump is then ground into chips and the hole filled with the stump chips so it can be re-used or covered. 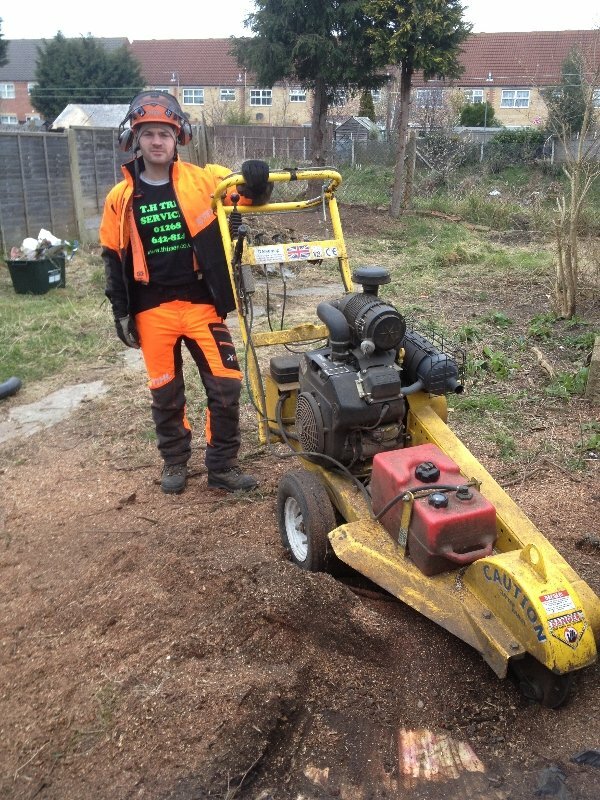 Our expertise in oak tree stump grinding Essex wide is well respected. The English oak is probably the best known tree in Britain and definitely the most common. Officially known by its Latin name as Quercus Robur, oak trees regularly grow in excess of 20 metres and sometimes up to 40 metres. 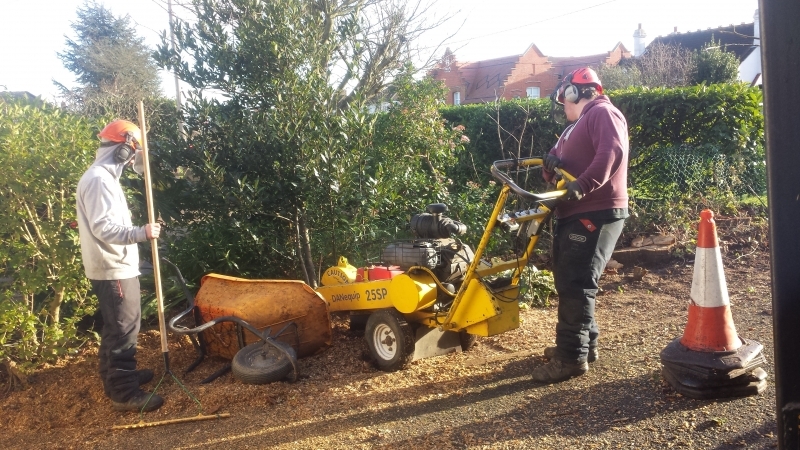 The fact they grow so tall and have expansive canopies supported by strong branches is not an issue, as our in-depth experience in oak tree stump grinding Essex wide and our specialist equipment allow us to tackle any task with ease. There are around 400 species of willow tree, known in Latin as Salix meaning ‘sallow’. When mature, willow trees grow to around 10 metres tall and have long lifespans up to 300 years. 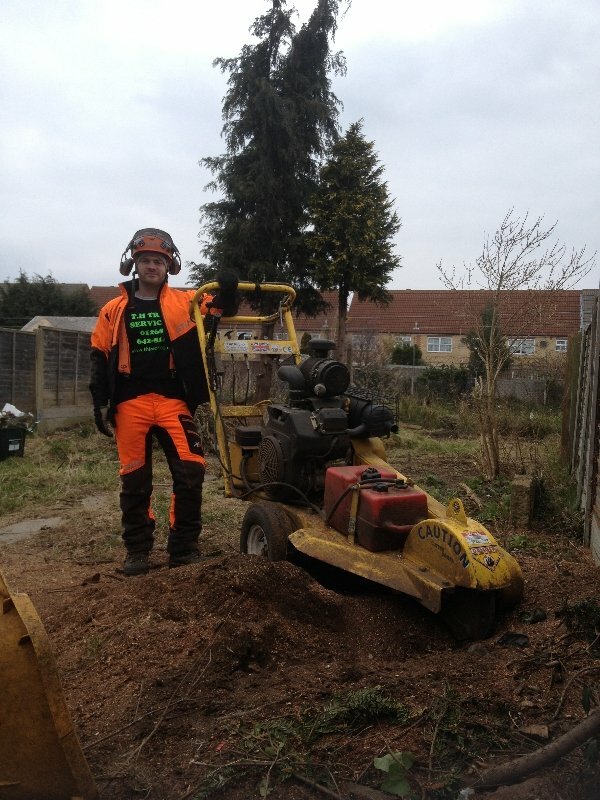 We have particular expertise in dealing with willow tree stump grinding Essex wide. Dealing with a willow tree stump does require specific knowhow, which thanks to our long term and wide ranging experience as qualified tree surgeons, we are able to offer. Conifer trees are well known for growing to soaring heights, sometimes up to 100 metres. Of the Latin Pinophyta, there are many different types of conifer including yew, pine, cypress and Douglas fir. If you have any type of conifer on your land, perhaps as a hedge or even just a single tree and it needs cutting back and the stump completely removing, you can rely on our expertise to safely tackle it. Even if you have a full row of exceptionally tall conifers, our Essex conifer tree stump grinding experts will be able to find a solution to leave you with perfectly flat land on which to go ahead and do whatever you need to. The eucalyptus tree is an evergreen variety which benefits from expert attention including coppicing and pollarding. Providing they are regularly pruned, eucalyptus trees can be suitable for small gardens, but left unkempt they will grow to quite a height and even in normal conditions they will easily shed bark and branches. If you have a eucalyptus tree stump that needs removing, we can help. Our eucalyptus tree stump grinding service is available Essex wide and we are able to handle any job safely and cost effectively, regardless of the size of the tree or its location, even if it is only accessible through a restricted entryway. Cherry belongs to the Prunus group of trees and there are various fruit bearing species across Europe. Cherry trees can grow wide and tall, often up to 10 metres, and despite the fact they produce delicious fruit and beautiful cherry blossom, they can easily become unmanageable. If a cherry tree stump on your land needs removing, we can offer the knowhow required and offer a safe and cost effective service as specialist cherry tree stump grinding experts Essex wide. The silver birch tree, known officially as Betula Pendula, is native to the UK. It can reach 30 metres in height and has a light canopy. The silver birch is a good tree to have as a neighbour if you are a plant, as its deep roots act as a channel for otherwise inaccessible nutrients. Of course these deep roots may cause an issue in other respects, sometimes making it a challenge to deal with silver birch tree stump removal. However this is not a problem for T.H. Tree Services, as we have developed specialist expertise in taking care of all the UK’s native tree species. If you have a silver birch tree stump that needs removing, you can rely on the capabilities of our silver birch tree stump grinding specialists in Essex to do so quickly and efficiently. Ash trees, scientifically known as Fraxinus Excelsior, are native to the UK. They can live to a ripe old age of 400 years, although this can be even longer if they are professionally coppiced. Often reaching heights of around 35 metres, the ash tree is known for being tall and elegant, and it is common for them to grow together so that a domed canopy forms. If you have an ash tree stump in Essex that needs removing, you can rely on the expertise of the tree surgeons at T.H. Tree Services to undertake the task professionally, safely and efficiently. Even if you have a row of ash trees that need their stumps removing, we can assist with a specialist ash tree stump grinding service Essex wide. The plum tree comes from the family known as Prunus Domestica, which also produces damson and greengages. Plum trees are not native to the UK but are still fairly common. They do not grow very tall and are characterised by straight branches and spiny twigs. If you have a plum tree stump that needs removing, we can help. Our qualified Essex plum tree stump grinding specialists are experts in dealing with the majority of the UK’s common tree species. Cedar trees are imposing evergreen conifers. They are native to the Lebanon, eastern parts of the Mediterranean and areas of Asia, but fairly common now in the UK. The Latin name is Cedrus Libani and the wood is a natural insect repellent. Cedar trees generally grow to around 35 metres and they are distinctive by the fact that they have several trunks. Despite the unusual shape, our Essex cedar tree stump removal experts are able to deal with taking out a cedar tree stump of any size without issue courtesy of our specialist cedar tree stump grinding service. There are a number of different species of pine trees. The Scots pine is one of the most common and is one of just three native to the UK. The Pinus Sylvestris as it is known will grow up to 35 metres in height and can live for up to 700 years. Despite the looming height, the specialist Essex pine tree stump removal specialists at T.H. Tree Services can offer to deal with pine tree stump grinding with reassuring expertise and efficiency. Even if your pine tree has grown to an unruly state, and is of particular height, we have the knowledge, manpower and experience to remove it and its stump effectively and swiftly. Call Essex best stump busters, T.H Tree Services on 01268 642 814 for a competitive quote in tree stump removal Essex wide.